I’m so pleased to be reviewing The Mistress of Pennington’s by Rachel Brimble today. I also have a short extract to share with you and a fabulous chance to win a £25 Amazon Gift Certificate. My thanks to JB from Brook Cottage Books for the place on the tour and for providing a review copy. 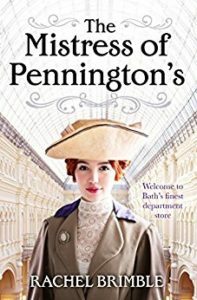 I was immediately drawn to The Mistress of Pennington’s when I discovered it was about a department store. I love books about shops. Inspired by The Paradise and Mr Selfridge, this is the story of Pennington’s in 1910. 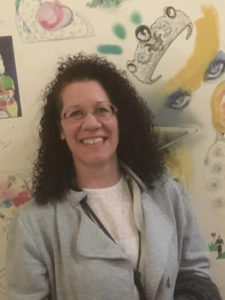 Elizabeth Pennington is desperate to be allowed by her domineering father to run Pennington’s one day and she is doing all she can to put her mark on it right away. She’s in charge of the ladies department but she wants so much more. Elizabeth is a great character. She’s feisty and ambitious, but so held back by the times. Women’s suffrage is in the background of this novel, and the knowledge that women are slowly coming out of the shadow of men fires Elizabeth to rebel against her father’s control. Joseph Carter is probably my favourite character though. He’s a glove maker who approaches Pennington’s with a view to them taking his gloves for sale. He and Elizabeth hit it off in more ways than one. He’s a lovely man, principled, strong, talented, but willing to do all he can for women’s rights and one woman’s rights in particular. The story is very much focused around Elizabeth and Joseph and I think it would have been nice to have some other characters fleshed out a little more. I’d also have liked more about the running of the store. But that’s my personal taste and if you like historical romance then this is most definitely for you, particularly as there is very much a will they/won’t they storyline. The Edwardian period is brought to life in this book very well by the author. I loved the details about the clothing that Pennington’s sold and the designs. I thought it was a really good read about a potentially trail-blazing woman. I understand there are another three Pennington’s books planned and it will be good to see what happens next with Elizabeth, Joseph and hopefully some of the other characters too. I never used to like the covers for this genre bu having been recommended one. i have never looked back. I love the settings and I kind of live in another world whilst reading. Thanks, Tracy. It is nice to escape into the past sometimes, isn’t it? Thanks so much for such a wonderful review! I’m thrilled 😁Hope you are tempted to give the book a read, Tracy!